Washington (CNN) – Sen. Rand Paul took to the Senate floor Wednesday to deliver a 31-minute speech in opposition to the judicial nomination of a former Justice Department official, David Barron. Barron has drawn the ire of senators on the right and left for legal memos he wrote justifying the killing of an American terrorism suspect overseas with drones. "I rise today to oppose the nomination of anyone who would argue that the President has the power to kill American citizens not involved in combat," Paul said on the Senate floor. Senators, however, believe they have the votes needed to break to break the GOP filibuster of the Harvard law professor to be a judge on the U.S. Court of Appeals for the First Circuit, which is based in Boston. In order to secure at least 51 Democratic votes to overcome the filibuster, the White House took the extraordinary step last week of sending the unredacted Justice Department memos to Capitol Hill where senators from both parties could review them in a classified setting in the basement of the Capitol. Top White House lawyers also met privately with Democratic senators to explain the memos and respond to concerns. "Once everything was explained," Senate Majority Leader Harry Reid, the Democratic leader, said Tuesday. "Most everyone in our caucus is satisfied." The administration is preparing to release one of those memos to the public for the first time, officials said Tuesday, though it won't be made public right away. It has to go through a redaction process that will need to be approved by a judge, according to the administration officials. Paul, who has spearheaded GOP opposition to Barron, is joined by a handful of Democratic senators and the liberal American Civil Liberties Union in opposing Barron. At issue are memos Barron wrote while working in the Office of Legal Counsel at the Justice Department, which gave the legal reasoning for killing Anwar al-Awlaki, a suspected American al Qaeda operative who was killed with CIA drones in September, 2011. "It isn't about seeing the Barron memos," Paul said. "It is about what they say. I believe the Barron memos disrespect the Bill of Rights." The Kentucky Republican, who has loudly opposed this issue in the past, said he's not trying to defend "traitors." "I can't stand the thought of Americans who consort with and advocate for the enemy. I want to punish Americans who are traitors to their country. But I am also conscious of what these traitors have betrayed," he said. "These traitors are betraying a country that holds dear the precept that we are innocent until proven guilty," he continued. "Aren't we, in a way, betraying our country's principles when we relinquish the right to a jury trial?" The potential presidential contender famously carried out a 13-hour filibuster over a similar issue. Last time, he was trying to block the nomination of John Brennan to become director of the CIA. However, Senate Majority Leader Harry Reid invoked the "nuclear option" late last year, making it incredibly difficult for filibusters to occur against certain presidential nominations. Paul lamented Wednesday that he would not be able to effectively try and block the nomination under the new Senate rules. "This nomination would not go forward were it not for the elimination of the filibuster," he said. Paul said he would come back to the floor later Wednesday to propose postponing the vote until after the public has had a chance to read the Barron memo. It's unlikely Democrats, who have pushed hard for Barron's confirmation, would agree to Paul's request. --absolutely nothing wrong with Obama's policies. Healthcare policy wrong? No wonder republicans are in dooooooooom, now. Cry me a river for Christ's sake. If you're an "American" and you take up arms against America(clearly which the "militia men" did), then you are an enemy of America and should be dealt with accordingly. Mr. Bundy has broken federal law. The federal government has every right to enforce it's laws. For an armed "militia" to take up arms against federal agents is an act of treason. Hmmm.... I do believe it was the federal government that decided it was of utmost importance to send in a heavily armed swat team armed with assualt rifles, in order to remove CATTLE. Talk about total insanity (they spent nearly a million). Had our own government decided to start shooting, it would have proven it is no longer our government. Had they started shooting fellow Americans involved in civil protest it would have demanded those people defend themselves. Lucky for the government they made the correct call. I know you clowns on the left what like to just kill anybody that oppposes you but that is not what a responsible government does. I think George Washington would have marched on the loony rancher. 1790's. Whiskey rebellion. Washington assembled the militia (gun-owners) in an army to march on US soil against US citizens refusing to pay federal taxes. Real history is lost on the loony right wing. Did you see which side the gun-owners / militia were on? A little different from the domestic terrorists nowadays. "All I said was that if McConnell wins then it will be about Obama's policies. If Grimes wins, then it will be about McConnell. What is wrong with that?" If Grimes wins, then it be because of the Affordable Care Act's success in Kentucky. And, if McConnell wins it will because of his policies in Congress. Confused? Yeah? Good, that's the idea. "Hmmm.... I do believe it was the federal government that decided it was of utmost importance to send in a heavily armed swat team armed with assualt rifles, in order to remove CATTLE. Talk about total insanity (they spent nearly a million). Had our own government decided to start shooting, it would have proven it is no longer our government. Had they started shooting fellow Americans involved in civil protest it would have demanded those people defend themselves." It is unfortunate that the right wing media has totally distorted the facts in the Bundy case, which was decided last October with a Bundy promise to shoot to kill if anyone came near his ranch to take his cattle. That is why government employees showed up with body armor and firearms. BTW, Bundy defenders should thank A.G. Holder because Janet Reno would have smoked them, cattle and all. A federal government that uses military type force on its citizens risks losing the trust and support of those citizens. There are lines that cannot be crossed. It is the whole reason the 2nd Amendment exists. I doubt many in the military will obey orders to shoot their fellow Americans for something like unpaid taxes or the round up of cattle. The last thing this government needs is to make a nation with millions of citizens with millions of weapons feel that they are the target of an oppressive federal government. Leftists play with fire when they talk about just killing fellow Americans in the name of government. Go home, and this time stay there. As an elected official he's worthless.
" I doubt many in the military will obey orders to shoot their fellow Americans for something like unpaid taxes or the round up of cattle." Still pretending that the order would have been given in the first place? What a ridiculous and frightening cartoon version of reality you live in. Nevertheless, G.Washington assembled the militia (gun-owners) to do just that. It was defused in the end and there was only a few accidental deaths. The loony rancher stand-off had zero deaths. The enforcement didn't go there to kill people. They went there to enforce the Law. Like George Washington. Did you read my comment? The gun owners in 1790's, the militia, were marching with the federal government enforcers. If you were a gun owner back then you would be expected to march with them. The 2nd Amendment was to maintain a well established militia. It has been replaced by the National Guard and other law enforcement agencies domestically. Conservatives need some history lessons to offset the sound-bite talk show mythology. 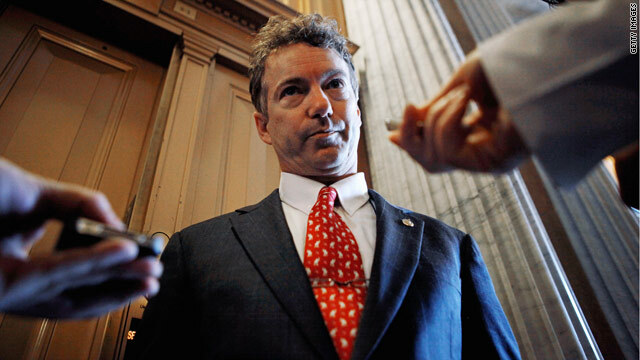 Do you know that Rand Paul is a knucklehead? What were you thinking? So, this is what it comes down to, tom I. Red State America doesn't "like" the current President of the United States so they are encouraged to vote for the bottom feeders? McConnell's approval is lower than Obama's. But, do vote for the man who's only goal thus far in his thirty plus year career is to make the current President of the United States a two-term president (and then spend the next 4 years railing against that President ... again)? All I said was that if McConnell wins then it will be about Obama's policies. If Grimes wins, then it will be about McConnell. What is wrong with that? I was merely commenting on Grimes' speech last night where she said that Obama is not on the ballot. No, he's not on the ballot. But I do believe his POLICIES will be on the ballot metaphorically speaking. And then all I said was we will see who is right. My goodness. Actually TomL, you refer to Obama on the ballot. I can see it right there. Not policies. And I suppose it is a complete coincidence that just now (May 20, 2014 Snopes debunk) there is a resurgence of the "Obama will change the law to allow third term" conspiracy theory? Soooo, I have no idea what you're trying to prove here, Silence. I am not a conspiracy theorist as you are trying to paint . I'm not a birther and I certainly know for a fact that Obama will not be changing the law so you can try and use some crazy people's thoughts in other people's posts but please don't do that with me. McConnell has an approval rating lower than Obama's. Grimes has deep pockets and the race is close and she said emphatically yesterday that Obama is not on the ballot. Metaphorically speaking he will be, in my opinion, on the ballot in a big way. The reps that have supported the ACA and many of Obama's policies appear right now, months from the actual election, to be in trouble as indicated by several polls. If McConnell is still able to win even with his terrible approval numbers, no matter how much he wins by, then it will absolutely be an indictment of Obama's policies and a desire by the electorate to stop Obama. If Grimes wins, then indeed it will be about McConnell and the actual candidate. Not sure what we're disagreeing about here. In my opinion, I think, and it appears that there is every indication to this point, that Obama's policies are what this election is all about. It's pretty simple. I think Grimes is wrong because Obama is metaphorically on the ballot. How much? Time will tell. You guys are amazing. It appears, once again, that the gang is in full support of our president who is nominating someone that feels that there is no need for due process and we should be able to kill an American on American soil who is suspected of terrorist activities. I'm sure the gang would have been in full support of Bush had he enacted this same policy. I'm sure of it. Even the ACLU agrees with Rand Paul on this. Shockingly, the gang does not. Weird. "A federal government that uses military type force on its citizens risks losing the trust and support of those citizens. ..."
Tell that to the families of black Americans who lost loved ones through local government sanctioned lynching, looking the other way as events transpired, and not prosecuting the guilty parties. Tell that to the civil rights protestors who, back in the 1960s, had fire hoses and dogs turned against them. Tell that to the members of your preferred political allies who cannot understand who those victims and their descendants do not vote for those who prefer your political ideology. McConnell has an approval rating lower than Obama's. Grimes has deep pockets and the race is close and she said emphatically yesterday that Obama is not on the ballot. Metaphorically speaking he will be, in my opinion, on the ballot in a big way. Metaphorically speaking Kynect is going to be on the ballot, too. If McConnell wants to take health care away from hundreds of thousands of Kentuckians, then he is welcome to campaign on taking it away from them, which is what repealing the ACA would do. It is a quid pro quo thing, tom. It is not weird, it is called compromise. Personally, I think President Obama should make Republicans put up first, but it seems that he's not. You are just arguing to argue because what you are saying is true in terms of the ACA being on the ballot. You just had to get your politically partisan non-point about "taking healthcare away from millions of Americans". Many people don't see it that way, Rudy. And polls show that. If McConnell wins, then they will not look at it through the same "lens" as you, Rudy They will be saying that the ACA needs to be fixed big time or repealed entirely – just like recent polling is showing. "You are just arguing to argue because what you are saying is true in terms of the ACA being on the ballot. You just had to get your politically partisan non-point about "taking healthcare away from millions of Americans". Many people don't see it that way, Rudy. And polls show that. If McConnell wins, then they will not look at it through the same "lens" as you, Rudy They will be saying that the ACA needs to be fixed big time or repealed entirely – just like recent polling is showing." You're sounding just like the hypocrite who started it all when he said this, "All I said was that if McConnell wins then it will be about Obama's policies. If Grimes wins, then it will be about McConnell. What is wrong with that?"